Members of Pakistan Film Producers Association sat in Karachi a couple of weeks back. The meeting had the likes of Humayun Saeed, Javed Sheikh, along with the biggest distributors, channel owners, producers, and basically, the giants of Pakistani cinema, locking their heads together for the betterment of the industry. In that meeting, sat a person who may not be known to you by face or name, but is someone who has established his own little place in a very short period. 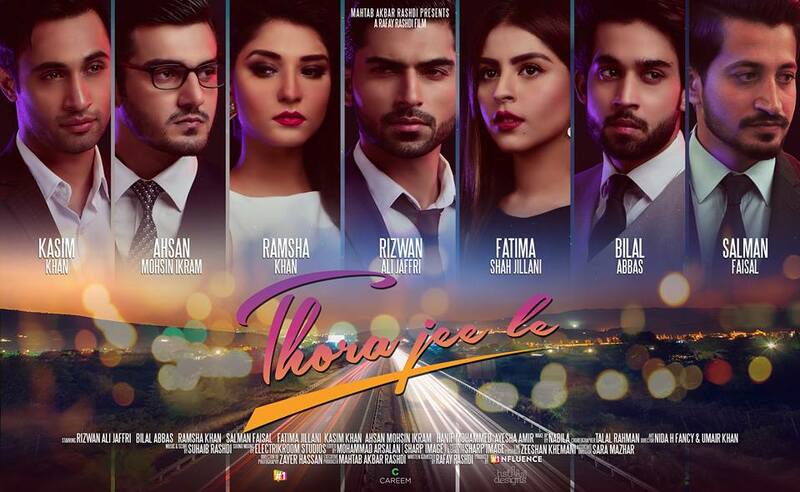 His film, Thora Jee Le, came out back in 2017 but could not manage to impress the audience. The failure of the film, however, hasn’t tainted his passion for movies a bit. In his journey of working on a passionate film project in Pakistan, he has been through a lot. His experience of making a film on a shoestring budget, facing naysayers at every stage, and even getting threatened, all makes up for an exciting story. Today, he shares that story with us. Ladies and gentlemen, we introduce you to the very blunt, very honest, Rafay Rashdi. Disclaimer: My first ever piece targets no specific institution or individual. It is entirely based on my experiences, learning, predictions, outcomes, and stability analysis in the media industry. It is my honest story of making an unsuccessful film in Pakistan. Pakistan film industry was still at the initial stages of its revival when I too, being a passionate filmmaker, decided to fulfill my dream of making a film. With no prior experience and connections in the industry, I thought to open the doors for myself with new talent in the film. This also included a fresh behind the camera team that I had carefully chosen after they met all the necessary criteria. Being an amateur, I consulted various professionals too. A senior scriptwriter advised; apparently after reading the script which she obviously didn’t like, to go for theater-based actors. I should have listened to her, but I was adamant and clear in my idea of having fresh faces. Faces that had signed up with talent agencies. Faces that considered the film a journey of passion and learning rather than being a merely paid job. Faces that are just made for movies as I believed the actors from both the mediums (television and film) should be kept separate. Therefore, I went ahead with my gut feeling. I also met a line producer who advised me not to make the film. He said no brand or advertiser would affiliate with the film because of its subject that revolves around drug addiction. It was expected. A film about cocaine culture would hardly be touched by the brand ‘Coke’ now, would it? Pepsi had a better chance – haha. I told that line producer that the film does revolve around a complicated theme, but I believe the brands would support the cause. He said that not only the brands would not support your film, but the new talent thing won’t work either. He was right on this point – people would hardly pay 7-800 rupees to watch new talent when they have the likes of Ranveer Singh or Vin Diesel or The Rock or Frozen playing right next to them. Utter Bummer. I took that as a challenge and decided to explore the marketing agencies myself. I went around to countless of these but none of them got back. Instead, they would quote me Aamir Khan and Shahrukh Khan films. Is there any comparison, like hello? They would suggest that an item number would help the film (crispy biscuit kha kay thumka lagaya, meethi ice cream kha kay maza aya). After that, I met a channel owner who offered support with the crew, cameras, lights, and everything else. She told me that the budget I had allocated wasn’t enough because “film is an expensive journey,” and one needs Atif Aslam or Rahat Fateh Ali Khan for the songs, along with other known faces to sell the tickets. I didn’t want any favors since I was financing the entire project myself. And therefore, I thought why not take a tougher course and meet film crews. I decided to search for a crew myself. It was an expensive deal but a lucrative one. The team I found knew how to do their job, and so far, are the only ones in the industry doing the job right. They, however, are quite pricy and will not give you any discounts. They mostly deal with a television commercial mindset and don’t offer fair price structures. You might get lucky though. These are few of the positive people who I blindly remember giving me all the accurate advice to sell the film and make money in Pakistan. I didn’t listen to any of those pieces of advice and went ahead and shot my film. I got to know that apparently, the “only” post-production company in town was interested in grading and editing my film, and I was invited to visit their facility (mind you, I shot my entire movie on a Canon C-100 Mark II). They were charging an arm and a leg, but I told them it was a ghareeb film with no cast value. I told them that literally, every location was my own, and it is primarily a startup film of a first timer, and therefore, requested for a discount. I knew that I wouldn’t get a huge concession, but hoped that they would have a soft corner for an independent filmmaker like me. They agreed to my discount request, and the deal was locked. They proposed their first level editor who had never done a film to edit my first film. Sab ne mil kar haath saaf kiyay. We released the teaser, and it garnered mixed feedback. People called it slow, tele-filmish, flop, new talent nahin chalega, this is not our culture, etc. etc. The post-production facility’s 2nd in line editor; who was apparently an expert at cutting trailers, advised that I rip off an Indian film’s trailer and take inspiration. I gave in, and the trailer turned out to be a gola ganda mix of a Pakistani and Indian trailer hash. Alongside, the dubbing of the film had begun as well, and it was probably the ONLY strongest trait of a local sound studio: their expertise – 2.1 surround sound, my requirements – 5.1 surround sound. My film would be their first ever to go through a 5.1 surround. Yup, I was desperate, and once again, Sab ne mil kar haath saaf kiyay. But I was simply in my own element of supporting every Pakistani film post facility because…. Pakistan Zindabad! We released the trailer on 25th December 2016, and the comparison quotes started pouring in, “oh yeh toh student of the year ki copy hai, fukray ka trailer chaapa hai, definite flop, yeh filmmakers telefilms banana bandh karden, etc., etc. To the telefilm part, I have a fun fact to share with you all. Even a film like Ayushman Khurrana and Tabu starrer, Andhadhun, hardly has a single cinematic frame in it, it’s the content that either sells or does not. But I guess the lack of trust in Pakistani films will exist for a while now. One fine day, a huge distribution company’s head greeted me with the utmost joy. It was as if we had been the best of friends since bachpan. He congratulated me for joining the film fraternity, and by this point in our meeting, I had secured a sure shot distributor. But then a snarky comment came, “Film main naya talent hai, channel ka onboard hona buhat zuroori hai – marketing nahin ho sakti” I was in shock with his remarks, double-guessing myself now. I wondered where was I meant to go from this point on with a small budget that I had? I went for a channel as advised. They offered a P & A (promotion and advertising) budget of a crore and a half, which I politely refused. Another channel owner and a film distributor later approached me and offered to have me onboard their brand. They offered extra marketing and extra mileage with an addition of ten additional names of producers on the poster to make things easier. I politely refused and stayed with the first person I had committed to. I went with that first distributor and decided to view my trailer for the first time in a 7.1 setup with a 2.1 output (special thanks to the sound guys because they insisted trailers are meant to be on 2.1). I distinctly remember that a small glitch had occurred with the DCP (Digital Cinema Package) and we had to get a new one. While we were waiting, I was sitting in a room which I remember had a funky premiere invite of a film called Actor In Law. The invite, as much as I can remember, was a small box which opened up into scales of justice or something similar. The distributor proudly picked that up and shoved it in my face, saying, ‘bhai yeh kharcha karna parta hai, jo aap nahin kar rahay (it’s true, I had no more budgets left but was constantly reminded of how much P & A matters). Finally, we moved on to the viewing. Briefly into the trailer, I was informed that the color correction was off and needed fixing (ek toh I don’t understand why distributors like to show their creativity off, especially when it’s not required). Fast forward everything, I signed the contract at 25% distributor, 25% exhibitor, and 25% channel marketing. This equaled 75% of the revenues, and of course, they were also going to cut the cost of any overheads on advertisements too. This meant that I would receive a peanut of a share of whatever my film earns, but sadly, that’s how things work. The trailer had launched, the post-production people with their discounts had done utmost justice, the people behind the sound guaranteed a 5.1 experience, and the stage was set. The technical directors of our industry, however, started mocking the film. They mocked it as a telefilm instead of a feature film, and suddenly, the leg pulling started kicking in from everywhere. I am yet to meet a single person who appreciates when a new talent promoting other new talent enters the market. The distributors started to pressurize for a release date as there was a ban on Indian cinema. I was told that cinemas were shutting down and the pressure was on yadda yadda yadda. Footfall nahin ayega, next month PSL hai soch lo blah blah. And so, I locked my date even though my film, at that point, was technically incomplete (and I was to blame for that). The sound people couldn’t crack a successful 5.1, and I was threatened to pay more because apparently, I had “wasted” their time. Similarly, the post-production people came out with more bills that I wasn’t made aware of at the time I was locking the budget for my film. It was a total mess. This was when I realized that the new producers are sucked dry to ensure that they never see the light of the day again. It wasn’t the end of the world though. I couldn’t give up. I had to get back up, and I did. Today, I wish though, that instead of opting for a Canon C-100, I would’ve gone for the Adnan Sarwar model of a simple DSLR, simple story, fewer people, less façade, and still survive. Things are much better now – we have more and more local films releasing every year. On Eids only that is, whereas the rest of the year has been kept free for the Fast and Furious sequels.